A few weeks ago it was Family Sunday at Life Church in Conyers Georgia. Instead of sending the kids off to Children’s Church they staid in the main sanctuary for the entire service and the kids participated in serving and reading scriptures etc. 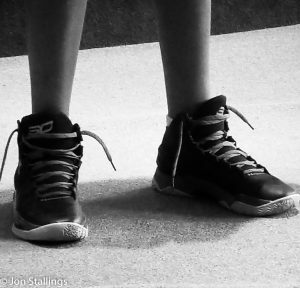 The shoes in the picture belong to a young man about 14. He was reading a scripture before we took the offering. I found myself captivated by his shoes. They seem so raw yet real. If you show up on any given Sunday to Life Church you will find some dressed in their Sunday best while others may be in jeans or shorts. Yes I am the pastor and you may find me in jeans one week and dress pants the next. We are pretty much a blue collar church. You also may see kids running around playing tag and yes you can find stains on the carpet in the sanctuary. This really describes a walk of faith. It is risky, messy and often very loud. I really don’t think kids laughing and playing will offend the Holy Spirit. Back to the shoes – I see them and I see hope for the future. People like to give the next generation a hard time. The up and coming generation always think they have all the answers. – Just like we did when we were the “next generation.” However, the day will come when they will rise to the occasion to lead. Many will find a passion for Jesus and they will spread the gospel and make disciples far and wide. There are a lot of struggles that lay ahead for our world. And a whole lot for America. Sadly a vast majority of our nation has decided to reject God and unless He intervenes our nation will grow to reject him even more. Persecution in America is only in its infancy but the gap between those who faithfully live for Jesus and those who reject him will grow glaringly obvious. There is hope though, for God will always have His faithful remnant. Despite what our culture says, God still sits on his throne and Jesus who died for this broken messed up world still sits at God’s right hand. There is hope, because I believe this young teenager who shows up to church in shorts and untied shoes hears the voice of God and I pray there will be thousands more just like him. They will take Satan’s kingdom by storm spreading the Kingdom of God. Get ready world – hope is coming!